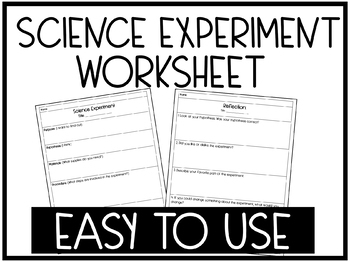 This science experiment worksheet is easy to use and is perfect for any experiment. It provides a place for students to record their data: purpose, hypothesis, materials, procedure, observations. The second worksheet focus on reflection. This provides a opportunity for the student to reflect on their experiment, like/dislike, favorite part, if they could change something about the experiment, and how do they think this will change the outcome.